The groundhog may have predicted another 6 weeks of winter, but everything points to an early spring here in Central Florida. Record high temperatures may be the easiest way to measure it, but Nature has its own way of telling us that my favorite time of year is here. Dead brown vegetation is suddenly covered in vibrant green. The Brown Thrashers and Common Ground Doves have returned to my yard. The American Goldfinches are turning yellow. 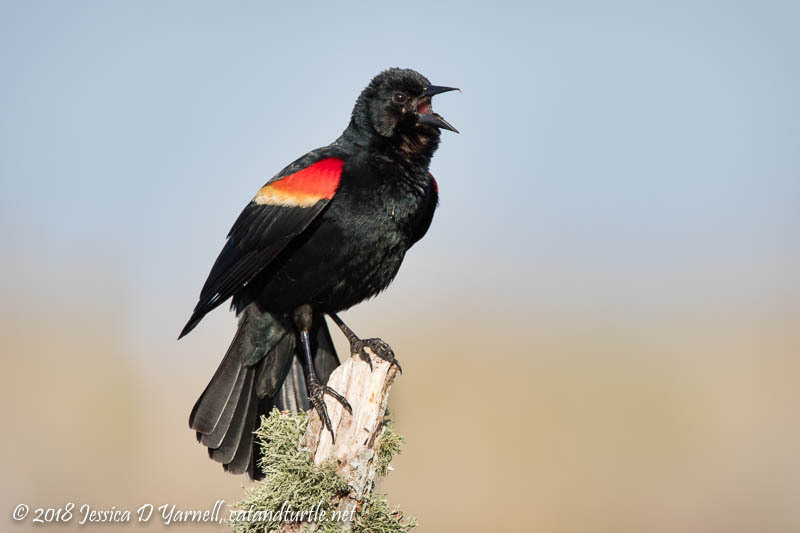 And yesterday at the Lake Apopka Wildlife Drive, the Red-winged Blackbirds have again taken to sitting high in the treetops, announcing their claim to their nesting territory. May the nest-building begin! The blackbirds are not the only birds interested in nesting. I saw several pairs of Anhingas already on eggs. I love the bright blue eye ring of these birds’ breeding plumage. 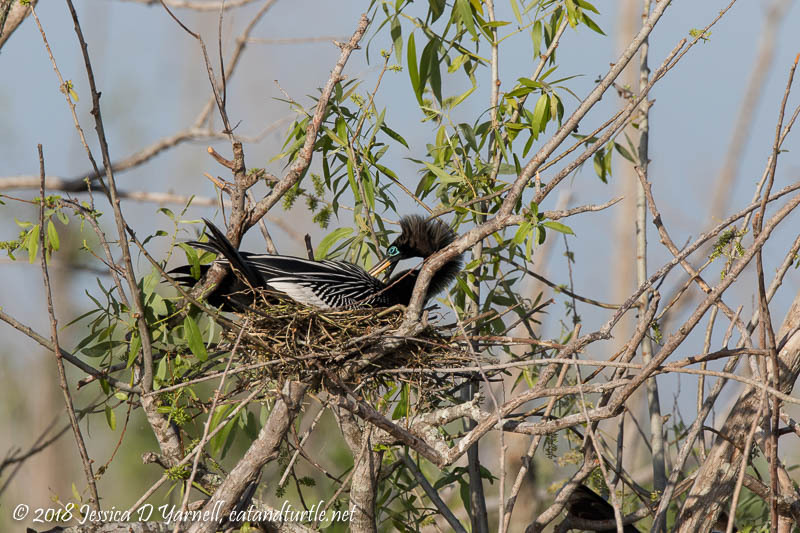 I watched as another Anhinga flew gracelessly to a nearby tree, broke off a branch, and brought it back to the nest. Much croaking ensued. There were fewer ducks along the drive. 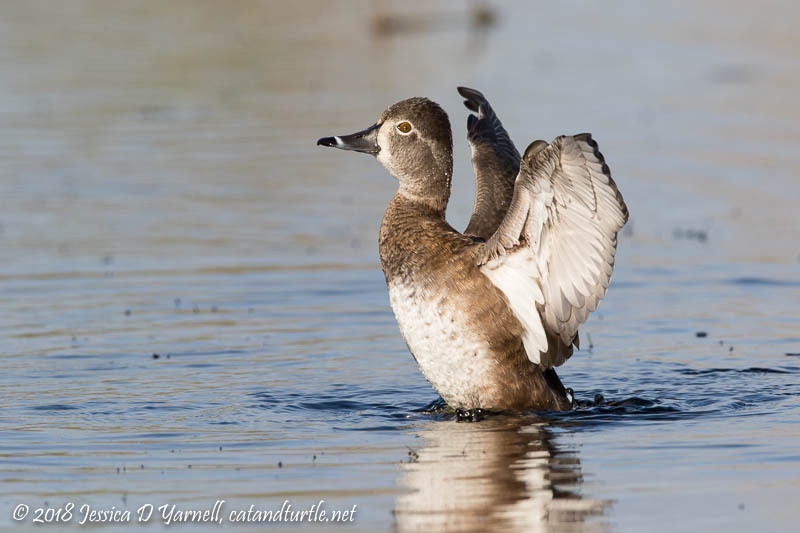 Ducks are one of the first birds to leave their Florida winter grounds and head back up north. My Hooded Mergansers near the house have already left. 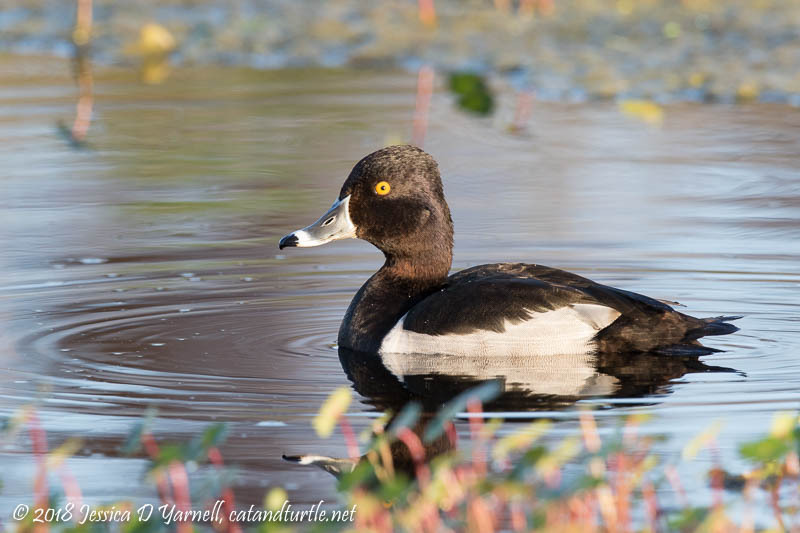 A few Ring-necked Ducks were still around. One was showing off his beautiful glistening feathers in the canal at the Lust Road entrance. Later I found a couple of female Ring-necks along Welland Road. They were busy diving for food, so they were hard to photograph because they didn’t stay up for long. Then I had to laugh. Two of them surfaced close to each other, and I think they surprised each other. “What are you doing there?” they seemed to ask. Then, as if each bird was asserting her right to surface wherever she wanted, both of them gave me wing-flaps in quick succession. Nice! 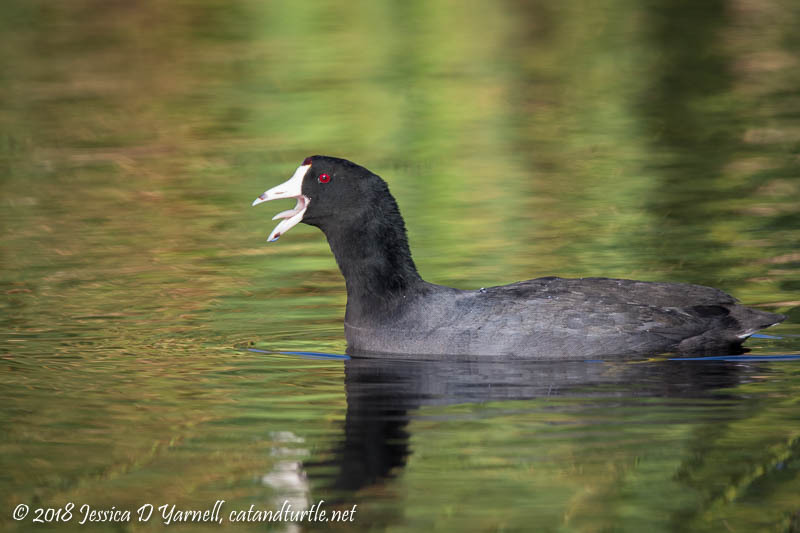 Other photographers like to make fun of me for photographing common birds, like this American Coot. But he was so pretty that I couldn’t help myself. The water around him glowed green with reflections of nearby plants. A couple of nearby coots called to him repeatedly, with that nagging, whiny call that echos throughout the wetlands. Every time they called, my bird answered with his own cry. It wasn’t until I got home and saw my photos that I realized he also stuck his tongue out at his friends! 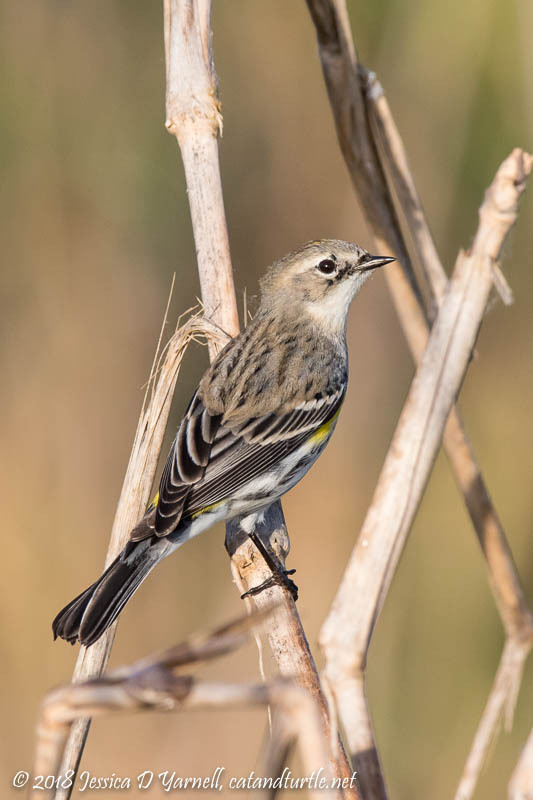 The wildlife drive is is covered in small warblers, mostly these Yellow-rumped Warblers. They are starting to molt into their spiffy breeding colors. They hopped all over the exposed branches, grabbing at insects. Then to my surprise, a small bird hopped out in front of me and he wasn’t a Yellow-rump! Hello, Mr. 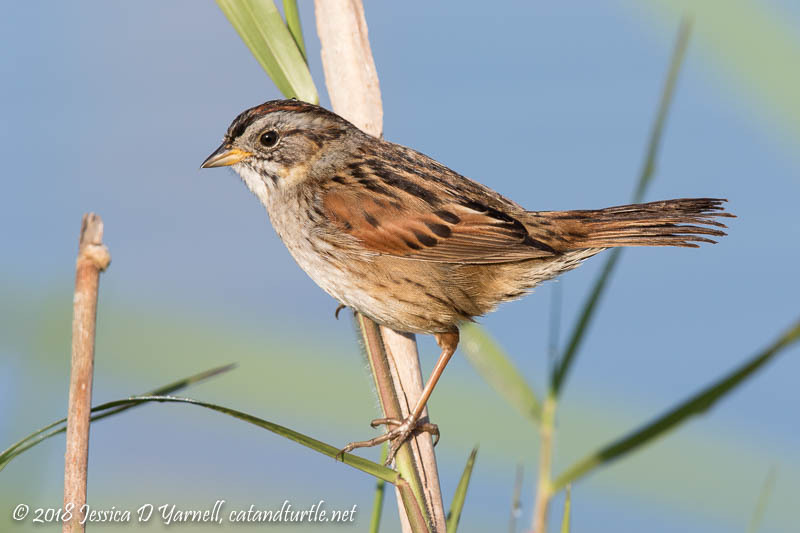 Swamp Sparrow! My last image is another common bird that I love to photograph in spring. 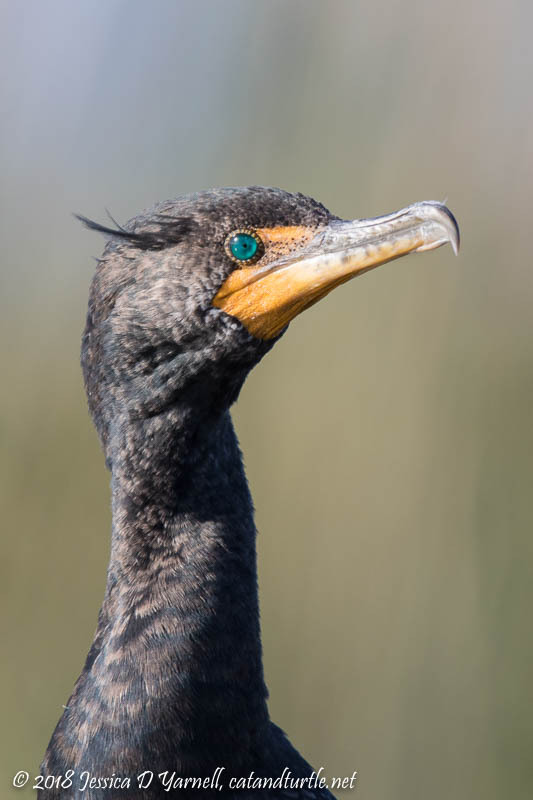 The Double-crested Cormorant develops a beautiful electric blue eye, and if you’re lucky enough to see him open his mouth, you see that his mouth turns a matching blue color. He also develops black “crests” on the sides of his head. Our Florida cormorants have black crests. In other parts of the country, the crests are a striking white color. This bird sat posing for me, showing off his spring spiffiness. Did I mention that spring time is my favorite time of year? Let the best time for bird photography begin! Wonderful “almost spring” post! Finally made it out there last Monday and the place was just so active with life! Tons of birds but also dragonflies, frogs, turtles, snakes. What fun!